Finishing Consultants expertise includes the complete finishing process, from fluid handling, to painting, and finishing ovens. Our product experts will help you to identify the right oven for your finishing process, industry, and space requirements. Whether you are an industrial, commercial, or manufacturing finishing operation, we can help to determine the best oven to complete your finishing system. A crucial component of electrostatic painting and powder coating, curing ovens are essential to the finishing process. 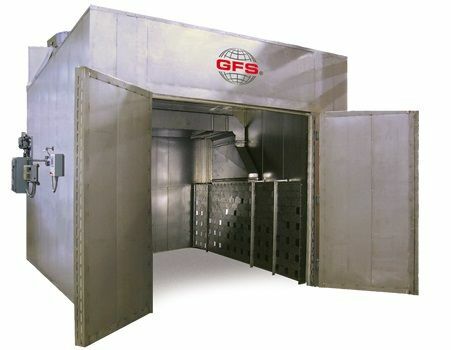 Our experience includes inline curing ovens, batch ovens for individual part control, gas curing ovens, electric ovens, and a variety of oven sizes and capabilities for your unique finishing requirements. Once a powder coat or liquid paint is applied to a surface via spray gun, it must be cured to complete the process. Curing ovens expose the powder or paint material to extremely high temperatures, causing the molecules to melt and chemically react with one another, forming a high-molecular weight polymer with a network structure. The resulting finished polymer is extremely hard and durable. Curing ovens can be electric or gas powered, and both achieve the same results. Additionally, curing ovens can be self-contained, standalone models with a single door or an inline oven with a conveyor system through the oven. Schedule an onsite visit today and one of your finishing consultants will help you determine the right oven for your needs!